Scholars debate the meanings of karma, but there seems to be consensus that karma involves a relationship between the cause and effect of 1) an action, work, or deed, and 2) the object, or intention, of the action, work or deed. A good deed produces a good effect; a bad deed produces a bad effect. We sometimes joke about karma. I might eat too much ice cream and say, “Oh, that will be bad for my karma.” I toss it out there, off-handedly, without much thought. It’s funny. We laugh. Those unnecessary calories can be worked off tomorrow, and that will be good for my karma. Balance. But what happens if I don’t exercise tomorrow and instead opt for more ice cream? Imbalance. Before I go on, let me say this: They way I see it, the Force, God, the Universe, or Higher Power are all euphemisms for the same thing, which is the creative Self that set everything into motion, the Prime Mover, as Aristotle said—the sine qua non (without which not) that makes the experience of perceived life possible. For most of my life, I’ve tried to understand just what the heck we human beings are doing here, in this apparent universe. I’ve studied ancient and modern philosophers. In my twenties, I learned a bit about Indian philosophies; I was introduced to meditation techniques and metaphysics. I was drawn to those things, but I wasn’t fully ready to wrap my soul around those concepts. In those times, I was thinking of philosophy merely as a means to an end, plain answers to my complex questions. I thought my life would be satisfied if only I knew the answers. And so things went, until I was introduced to Siddha Yoga by a co-worker. Even then, I was still (subconsciously) looking for answers within the framework of my Western brain. Over time, I became transformed. For me, the way to make sense of life in this world lies within the perspectives of karma and reincarnation. 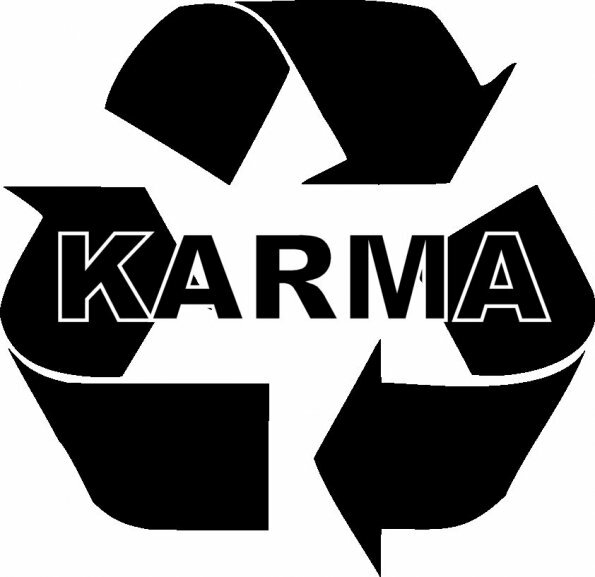 We live in a world of Karma. I’m not just talking about karma in the sense of my ice cream example or somebody cheating on an exam and then getting caught (that’s karma with a small k); that might have nothing at all to do with Karma with a capital K, which is the notion of past actions performed in previous lives that bear influence on a present life. Karma is at the core of our responsibilities to others and ourselves. Everything we do in this world can be qualified in terms of Karma. Every choice, each decision, no matter how great or small, has an effect moving forward. Literally, ‘decide’ means ‘to cut away,’ so we ought to carefully weigh the risk-benefit aspects of as many decisions as we can. Not that we should be obsessive about minutia, but looking at our lives as a series of choices ought to give us pause with every step we take, to minimize internal conflict. War is an extreme exaggeration of an outward manifestation of internal conflict. There is always a war somewhere in the world, because there is always inequality, greed, lust for power, or general dissatisfaction with the status quo; all of these are fodder for conflict. The underprivileged struggle to raise themselves by their bootstraps—Jesus said the poor will always be with us (Mark 14:7); the rich grapple with how to best use their wealth; and those in power make governing decisions; such things individuals must learn to do in accordance to their sadhana (physical and mental work toward achieving “all-pervasive Consciousness”). Unresolved issues (samskaras) follow us like comet tails. The only way to escape them is to face them and deal with them until they are mastered. There is a deeper aspect of karma that applies to more than the thousands of causes and effects experienced in day-to-day living. That aspect is Karma with regard to reincarnation. This is a planet of Karma, where souls come again and again until they reach spiritual perfection. I believe we’re all here to fulfill a karmic map. Karma created in a past life is the cause for the requirement of rebirth, reincarnation. Karma isn’t simply the connection of one manifestation of life to a series of others. It’s the embodiment of accumulated actions carried forth from life to life. In this life, we create new karma, but any karma we create is reconcilable, so long as we are conscious of action and deed. Some people are born into wealth, some into poverty, others in between—it’s all for the purpose of learning to use a given situation to become a better person. Situations on this physical plane are a reflection of actions performed in past lives, and not everyone will find bliss in his or her present life; that is the nature of Karma. Things that occurred in past lives are being worked out in the present one, and it might take many more lives before those matters are resolved. Life is hard on this planet of karma; but facing and overcoming challenges is what will make us outgrow the need for reincarnation. The only way to cease this reoccurrence and completely live forever in the Self is to resolve our life issues. A good example of this process can be seen in the movie “Groundhog Day,” in which protagonist Phil Connors wakes up on the same day, in the same place, at the same time, reliving those 24 hours until he overcomes his ego and learns that bearing true love in his heart is what it takes to become a good man. Only then is he liberated. “Except a man be born again, he cannot see the kingdom of God.” When there is no longer a need for the soul to come and go in this life, we shall be liberated to live forever in, and as, the Self. Perhaps that is Heaven. Regardless of whether you believe in reincarnation or any sort of afterlife, the Truth of what shapes our experiences within our apparent reality (maya) will ultimately be revealed. The important thing is to remain steadfast in our resolve to lovingly recognize our mistakes and not repeat them. When you believe in the Karma of reincarnation, each life is an opportunity to do just that. Eventually, all questions will be answered. This entry was posted in ego, Groundhog Day, Karma, Love, Reincarnation, Spiritual Path, Spirituality. Bookmark the permalink.